Full Circle for this Friendly Home! Years ago, I helped friends from our church, Daniel and Jennifer, buy their first home in Crystal. When they accepted a position in another country, and needed to prepare to move there, we were honored to help them get their home ready to sell. We sold immediately, in multiple offers, however, the buyer was quite nitpicky in the inspection and we decided to move forward with searching for a better suited buyer for this home. That same weekend, another couple, Cassie and Kyle, reached out to me saying they wanted to start looking for their first home. They both work at the church that we all go to, and they wanted something close to the church, but not necessarily next to it. They also wanted to focus on finding a home where they could enjoy their family, walks, and a great neighborhood. They have a beautiful little boy and they are some of the most wonderful people I have ever met. Cassie has a heart as big as the world! 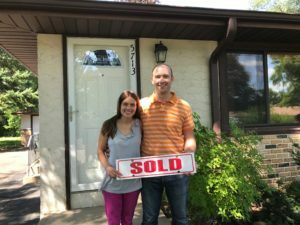 Cassie and Kyle are friends with Daniel and Jennifer as well, and when they found out the sale on Daniel and Jennifer’s home fell through, they swung by the house to look at it. We were off to the races with making a solid offer and getting that worked out with Daniel and Jennifer. It has been one of the most wonderful experiences, as I have been able to help our friends buy this house. They are now looking forward to tackling some updating projects at the home. Cassie and Kyle, I am very excited for you and I wish you the very best as you settle in and put your personal touches on this home. Thank you so much for allowing me the privilege to be part of this journey with you. I know Ira will love the yard and make friends in the neighborhood!